Funny how the British are obsessed with weather, almost as much as we Singaporean are with food. A typical conversation will almost certain to start with a polite inquisition over the weather, e.g. how good/bad the recent weather has been. After residing here for over 10 years, I find myself to be doing exactly the same, rather than doing a very Singaporean 'Have you eaten? ', I would embark on a 'woo, it's a bit chilly isn't it' or 'Can't believe it's raining again' etc as my opening lines to practically any chit-chat. On that note, it has been a bit chilly lately, hasn't it? All the flurries of snow and cold northernly wind is making me crave lots of warming bowls of soup, but not just any soup, noodles soup to be more precise. Yes, the ultimate Chinese comfort food - a hug in a bowl. Noodles are quickly cooked in boiling water, drained and plonked into a serving bowl. This is then ladled with a tasty broth before adding the all important toppings to complete the dish. They are said to be the epitome of a Chinese fast food. Unlike the Japanese ramen or the Vietnamese pho, the broth for a Chinese noodles soup quite often plays second fiddle to the exciting all singing and all dancing toppings. Many uses clear broth which doesn't take much time to prepare, no 10-hours of gently bubbling away but rather, the emphasis are on the various toppings. There are however, a few exceptions where the broth is just as important and this Braised beef noodles soup is one such fine specimen. And with freezing temperature still upon us, I've decided to forsake the Sunday roast last week and cooked this instead for a change. This is most definitely not a dish for a rush job. In order to do this comforting noodles soup justice, a cut of beef that will withstand long duration of slow braising is needed. Here I have selected the brisket which is perfect for this method of cooking. 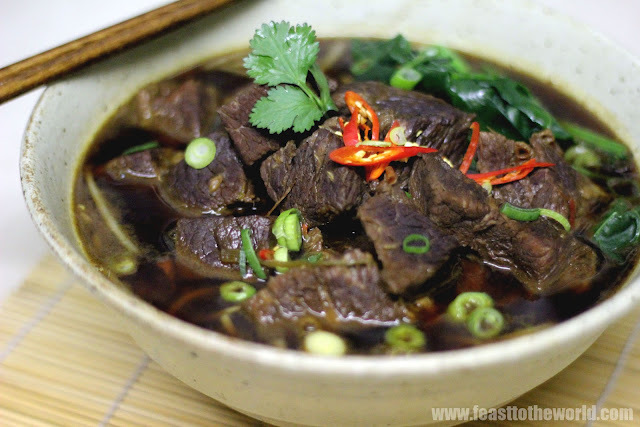 After about 4 hours of simmering, the beefy flavours seeped into the broth and the meat turned into melting flakes of unctuousness. The spices gave the finished broth a welcoming warmth and richness and was the perfect antidote for combating the cold weather outside. And as I was feeling generous, I rewarded myself with a generous helping of the tender beef, the perks of being a chef. And like I said before, this was meant to be a swap for the usual Sunday roast after all, I wouldn't accept anything less. Heat a wok over medium heat, add the oil and heat until smoking before stir-frying the spring onion, garlic and ginger for 30 seconds, until fragrant. Add the cinnamon sticks, star anise, cloves, Szechuan peppercorn and water. 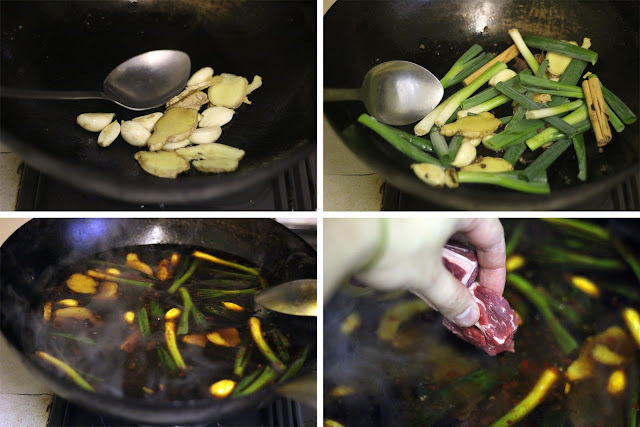 Bring to the boil, add the chilli bean paste, light and dark soy sauce, rice wine, sugar and the beef, then return to the boil. Reduce the heat and simmer, covered for 3 - 4 hours, until the beef is very tender. Skim the surface occasionally to remove the scum and impurities. Bring a large pan of water to the boil. Cook the fresh noodles for 2-3 minutes, if fresh and 10 minutes if dried. Then drain, rinse in cold water and divide into individual bowls. Bring the water back to the boil and blanch the greens for 30 seconds. Drain and add to the noodles. 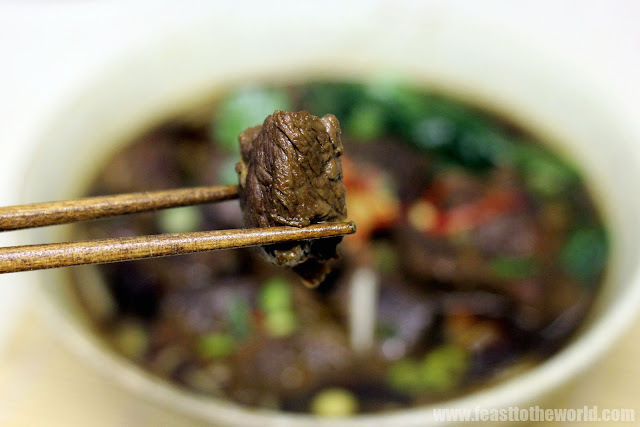 Spoon a few ladleful of hot steamy broth over the noodles and top with the beef. Garnish with the red chilli, spring onions and coriander. 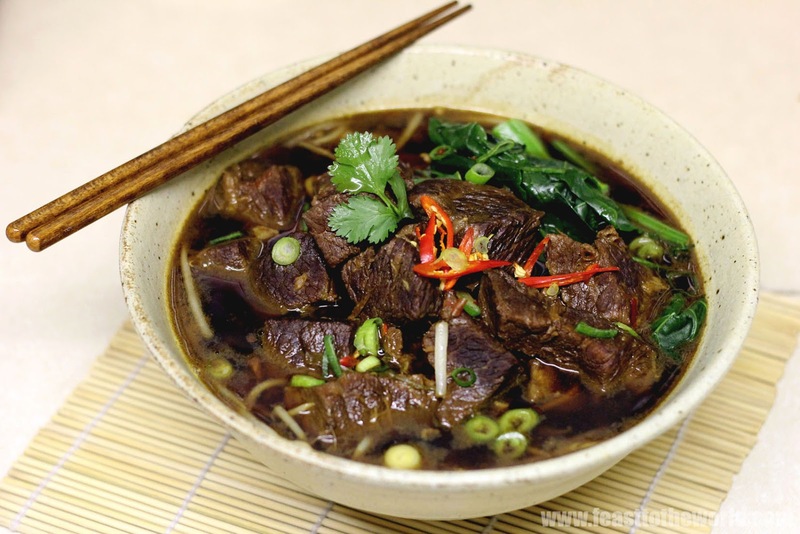 I love red braised beef, especially if you drop some cubed up daikon in there, or tofu sticks to absorb some of the soup. Ooooh.....that will make a very hearty dish indeed! made this last night, with added tofu sticks, really lovely on a cold night!